By now you've probably seen what's become one of the buzziest holiday stories of the year: the video for Olivia Newton-John and John Travolta's new Christmas duet "I Think You Might Like It," which features the former "Grease" co-stars singing along as Travolta, 58, lands a plane, Newton-John, 64, slowly drives a convertible, the couple line dances, and various people have reunions in a small airport, including Travolta's wife, Kelly Preston. And you've probably seen the coverage. A sweep of the web finds outlets describing the video as everything from bizarre to odd to cheesy to must-see. But whatever you call it, the world can't stop watching … and wondering. To answer some of your burning question about the festive video, omg! talked exclusively with its director, Rav Holly. Why does the video seems kind of, well, low-budget? Because it was low-budget! There was never a plan for a music video, explains Rav Holly, a still photographer by trade, who was originally hired to shoot photos for the album. Initially, all that was required video-wise was a very short promotional snippet and some B-roll for the electronic press kit, but Holly thought they might as well go all the way. "I actually got a hold of John and said, 'Look, you guys haven't done anything together in 35 years. People would love to see you guys together.' They said, 'Do you have the means to shoot a music video. I said, 'Yeah.'" The entire video cost about $12,000 to make. "Olivia and John paid for this out of their own pockets," reveals Holly. "There was no budget ever done for this video. They budgeted everything for the CD, which was into the hundreds of thousands of dollars between them." In the end, the duo allotted $9,000 for the video, including Holly's and co-director Corey Molina's salaries. But the video ended up going over budget, eventually costing $12,000 (still a relatively small sum in the world of music videos). It was a quick group effort. "When we stepped off the plane in Florida, we didn't even have a concept on paper," says Holley. "We spent four hours putting the video that I had in my head on paper together. John had a few ideas, like him and Olivia coming off the plane. The car, that stuff was my idea. We all just brainstormed and put the whole scene summary together and had to match that with lyrics." Why was it shot in Florida? Because that's where Travolta and Newton-John live and the Australian singer/actress was only going to be able to participate in the shoot for one day. The entire video was shot at the Ocala airport, behind the gates of Travolta and wife Preston's exclusive community of Jumbolair (where nearly every resident has a private jet), and on the runway adjacent to their home. Why does the video plotline seem kind of disjointed? 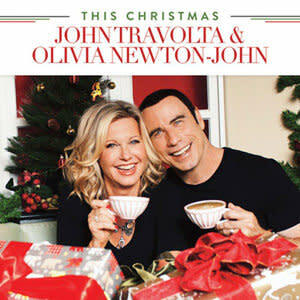 Three days into what they thought would be a six-day shoot in Florida, Holly and Travolta got word that iTunes was requiring the finished product just a few days later in order to get it processed for the holiday season (an important deadline since the video and song was going to be available for purchase with proceeds going to charity). That meant they would have to go into a nearly 24-hour editing session right away and wouldn't be able to shoot scenes in Ocala's town square, including the city's annual tree-lighting ceremony. So here's what you would have seen, according to Holly: "When you hear the bells in the beginning, it was going open up on the empty town square. And as the video built, it was going to show them getting the town square ready and putting up the decorations. The very end of the video was going to be the lighting of the Christmas tree with 22,000 people turning around and saying 'I Think You Might Like It.' We had already scouted the buildings. We were going to be up on the high buildings shooting. The tree lighting had to happen without us. We were editing. We did it with about a quarter of what we were supposed to have shot." Whose idea was all that line dancing? The world can thank Travolta for those nuggets. "I had told him to please brainstorm because we were going to need extra fill footage to add in anywhere that we didn't shoot a full scene," says Holly. Who are those people in the airport? In addition to John Travolta's wife Kelly Preston, their son Benjamin, and daughter Ella, the rest of the cast was made up of Ocala locals who Travolta summoned together. The police officer in the airport scene is indeed an actual police officer, and the while the man dressed in military garb that he hugs in the video isn't actually in the military, he is the cop's real-life son. All the other "actors" are also related to those they're greeting in the video. Prior to Holly and his team leaving town, Travolta and Preston hosted a screening in their home theater for all of their neighbors who had participated. "The people who were in it were ecstatic," Holly shares. "Kelly cried when she saw it. They all loved it." So what does Holly think of all the coverage … good and bad? "It's like anything else. When you're a creative person and you put stuff out there you're going to have people who like it and you're going to have people that hate it so you just have to take it with a grain of salt. But it's all the buzz right now and they say no publicity is bad publicity," he says. "I've read comments from people saying we should have just trashed this, but on the other hand there are a lot of Olivia Newton-John and John Travolta fans that actually liked it. They're not taking it seriously. They see what we were doing. We were just making something that was lighthearted and fun to a lighthearted and fun song. 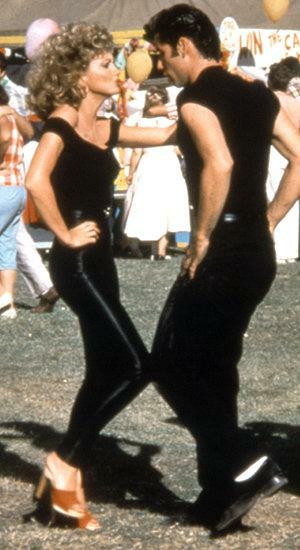 We weren't doing anything nostalgic or anything that was competing with 'Grease.' It was just a fun little video and we did what we could with what we had in the time we had to do it. I'm happy with it." And finally, how did a photographer from Long Beach, California, who had more experience shooting weddings than music videos end up working with John Travolta and Olivia-Newton John?